The front raised bed with ollas. 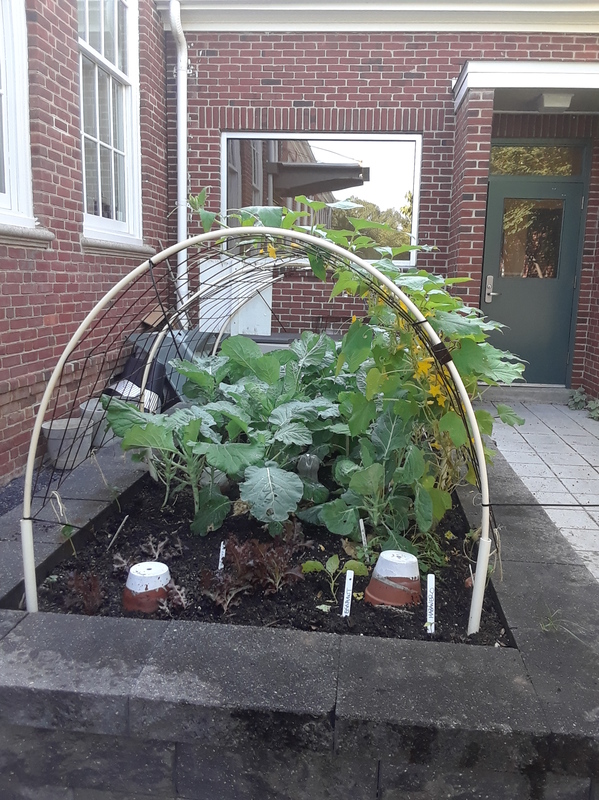 Winter’s cold frame and winter sowing jugs at Fairlington Teaching Garden gave way to spring planting and now in summer to maturing vegetables and flowers. Cucumbers and peas festoon the hoops of the front raised beds while red lettuce and collards cover the soil surface below. Beans grow in rows near the steps. At the side of the steps are large pots with nasturtium and sweet potato plant vines climbing up a bamboo pole. In ground level strips of earth grow foxglove, coleus, zinnia, chrysanthemums, cardinal climber, lupine, strawberries, and Canterbury bells. There are many herbs, as well. The back raised bed burgeons with jalapeño and habanero peppers, Russian kale, and squash. Growing in self-watering buckets are heirloom tomatoes. Near the back gate, under a small shade tree, amongst the blossoming flowers is a bench. In two areas of the garden, vertical pallets are planted with succulents. Most plants in the garden were grown from seed or seedlings from home gardens. Master Gardeners maintain an arduous watering schedule. An empty cistern sits in a fenced and graveled part of the garden. Lily Whitesell and Aileen Winquist of the Arlington County Department of Environmental Services helped obtain the cistern, and the hope is to see it up and functioning soon, so that more rain water can be used. The MGs continue to plant, weed, and maintain the garden, fretting over each seedling and appreciating each bloom. They enjoy the Fairlington Teaching Garden as a place to try innovative and eco-friendly methods. Two signs, one about planting and the other about watering, are posted. These rhyming signs are reminiscent of the Burma-Shave signs seen in the 1950’s along Route 66 and provide a pleasant accent to the garden. The Teaching Garden is located in an alcove adjacent to the loading dock behind Fairlington Community Center, 3308 S. Stafford St., Arlington, Virginia. 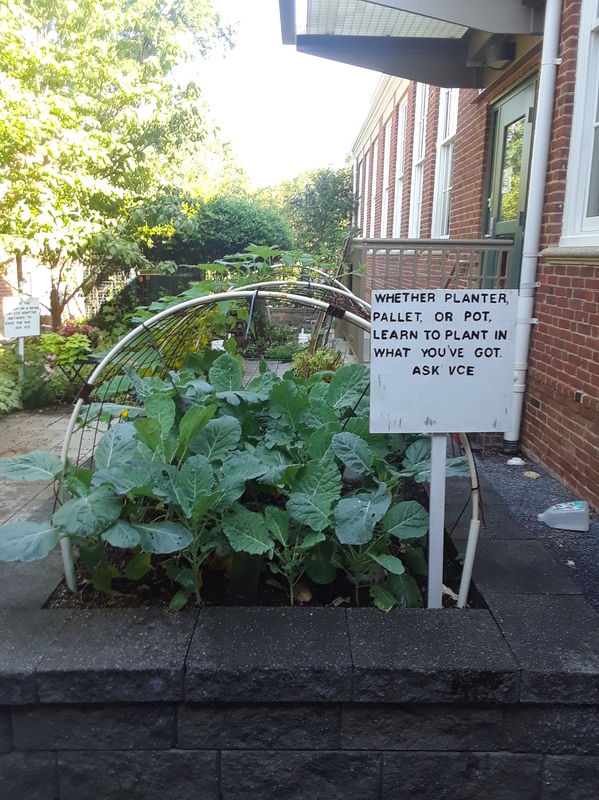 This entry was posted in Teaching Garden and tagged cistern, Fairlington Community Center, pallet garden, raised bed, succulents, Teaching Garden. Bookmark the permalink.